My sister-in-law made this for our 4th of July celebration! 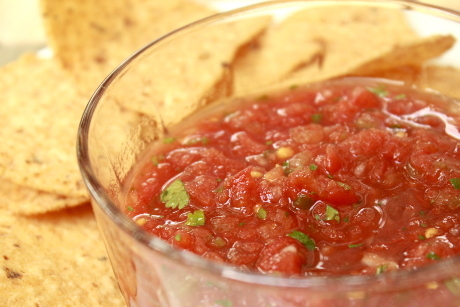 I’ve tasted many different homemade salsa’s in my life, and I have never liked any of them (usually the tomato flavor is too strong), but this was PERFECT! Note: You will need a 12-14 cup food processor. If you only have a mini-processor, then process the ingredients separately and then mix them all together in a large bowl. Combine the cans of tomatoes, onion, jalapeno, garlic, sugar, salt, cumin, lime juice, and cilantro in a blender or food processor. Pulse (important to pulse or you will have soup) until you get the salsa to the consistency you’d like—about 10 to 15 pulses. Test seasonings and adjust as needed. I would like to try this again using fresh tomatoes and fresh green chilies (trying to eliminate canned food & BPA from our diet). I will update this post if it turns out just as good.